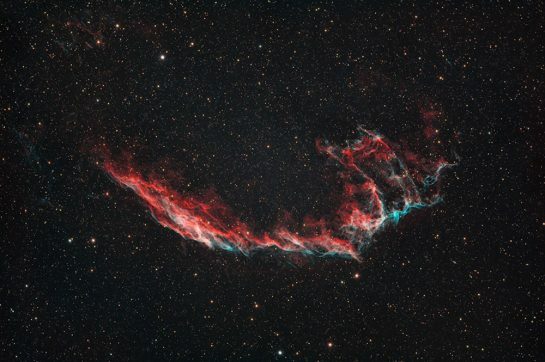 You may have noticed that amateur astronomers and astrophotographers will often describe their sky quality reading when posting pictures or discussing observations. 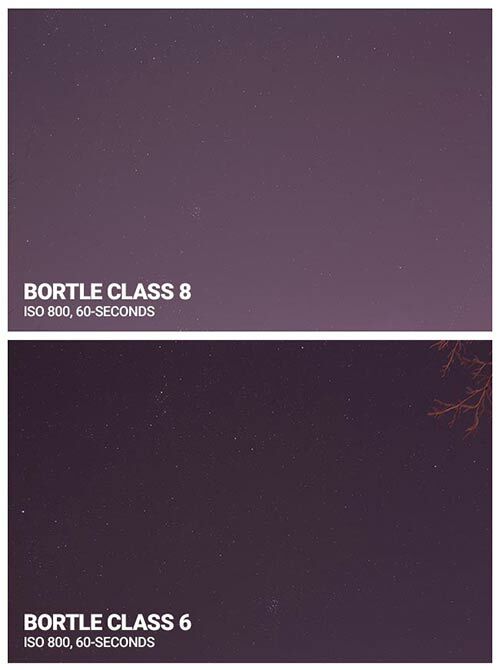 One of the easiest ways to identify the brightness of your night sky is to use the Bortle scale. A light pollution map will show that a large city radiates white to red from the center, and rural areas will appear green to blue. These colors represent the amount of artificial light in the area, and how bright the night sky will look. There are a number of ways to measure how much light pollution affects a given location (SQM, NELM), but my personal favorite way to gauge the quality of a location is the Bortle scale. I have personally battled with light pollution in my backyard when taking deep sky astrophotography images. The sky quality at my home is a class 8 on the Bortle scale, which is the second brightest sky possible. As discouraging as these readings may sound, it doesn’t mean that you can’t enjoy astronomy (and astrophotography) in conditions like this. I later moved from a house under Bortle Class 8 skies to a Class 6, which made a big difference in the amount of light pollution I observe from home. Aside from the opportunity to collect astrophotography images with improved signal, I am also able to see many more stars in the night sky from my backyard visually. What is the Bortle Scale? The Bortle scale is a way of measuring the quality (brightness) of the night sky for a particular location. There are nine levels to the Bortle scale with Class 9 being the most extreme amount of light pollution. Unfortunately for many backyard astrophotographers, their primary imaging location is much farther down the Bortle scale then they would like. For example, my Class 8 backyard sky has the title of “City Sky”. This is an appropriate description of my night sky quality, as I live in the center of a medium-sized city (Population of 130,000). 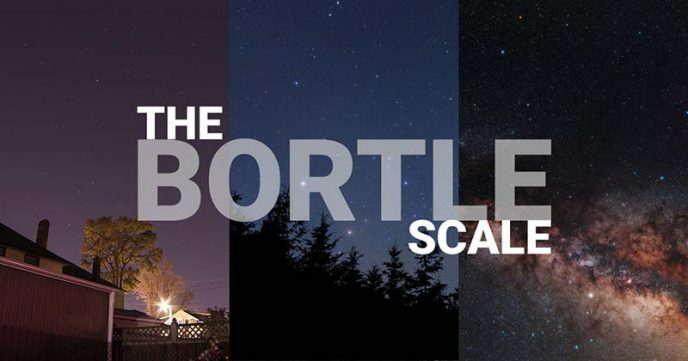 The Bortle scale uses astronomical observations to measure the amount of light pollution for a given location. For example, a Class 1 Bortle sky means that one can observe M33 (Triangulum Galaxy) as a direct-vision naked eye object. There are specialized tools available to measure sky brightness from a very localized area such as a sky quality meter. I prefer to use online resources such as light pollution maps that will give you an approximate reading for any location on Earth. 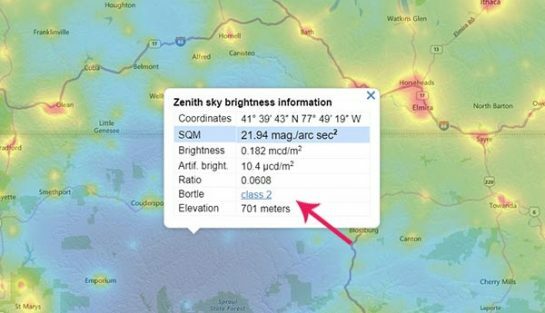 The free light pollution map tool lets you plot a specific point on the map for a Zenith sky brightness reading. In the example below, I can see that Cherry Springs State Park is a Class 2 on the Bortle scale. 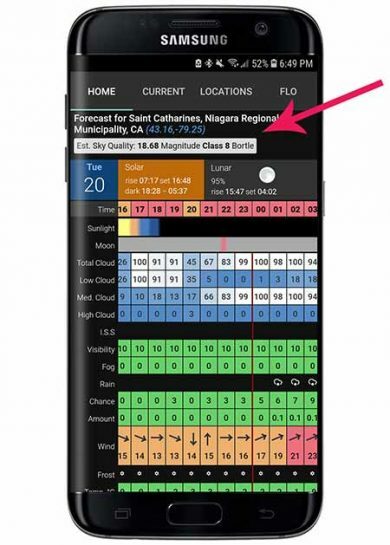 Another easy way to measure the sky brightness of my backyard and the dark sky sites I visit is using a smartphone app called Clear Outside by FLO. This uses your current GPS location to present you with an accurate readout of where your night sky lands on the Bortle scale. It also provides you with an estimated sky quality magnitude. 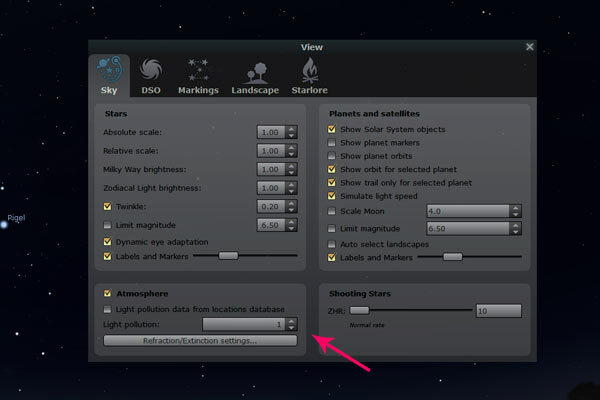 Stellarium, a free planetarium software, lets you adjust the amount of light pollution in the settings. This is useful for matching up the view in the software with the brightness of the night sky from your coordinates. The faint stars begin to disappear as you increase the light pollution number. John E. Bortle created the scale in 2001, which was published in Sky & Telescope magazine. 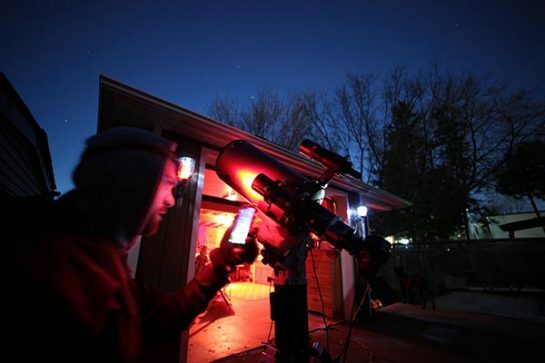 Its goal was to help amateur astronomers get a better understanding of the darkness of a particular observing site. 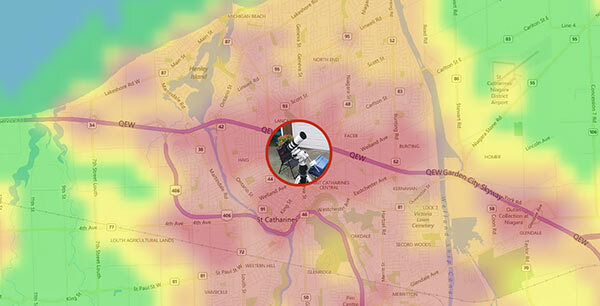 It uses practical celestial observations to estimate the overall brightness of the sky. Below is a summary of the benchmarks used to classify each of the 9 classes of the Bortle Scale. For a detailed description of each class, you can read the full article from Sky and Telescope. Zodiacal Light, Gegenschein, and Zodiacal Band Visible. M33 Galaxy visible as naked-eye object with direct vision. Scorpius and Sagittarius region of the Milky Way cast diffuse shadows on the ground. Viewing Jupiter or Venus degrades dark adaptation of your eyes. The brightest parts of the Milky Way look like “veined marble” when viewed with binoculars. Zodiacal light is bright enough to cast weak shadows. Clouds in the sky are visible only as dark holes in a starry background. Several Messier globular clusters appear as naked-eye objects. Slight signs of light pollution along the horizon. Clouds appear faintly illuminated in the brightest parts of the sky. 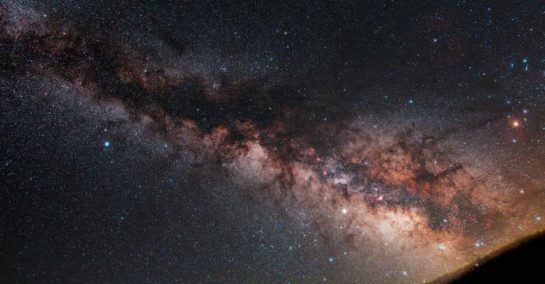 The Milky Way still appears complex. Globular clusters M4, M5, M15, and M22 are all distinct naked-eye objects. M33 is easy to see with averted vision. The zodiacal light is striking in spring and autumn. Fairly obvious light-pollution domes apparent over population centers. Zodiacal light is clearly evident but doesn’t even extend halfway to the zenith. The Milky Way well above the horizon is impressive but lacks all but the most obvious structure. M33 is a difficult averted-vision object. Clouds in the direction of light-pollution sources are illuminated but only slightly. Hints of the zodiacal light are seen on the best spring and autumn nights. The Milky Way is very weak or invisible near the horizon and looks rather washed out overhead. Light sources are evident in most if not all directions. Clouds are quite noticeably brighter than the sky itself. No trace of the zodiacal light can be seen. The Milky Way is apparent only toward the zenith. The sky within 35° of the horizon glows grayish white. Clouds anywhere in the sky appear fairly bright. M33 is impossible to see without binoculars, and M31 is only modestly apparent to the unaided eye. The entire sky background has a vague, grayish white hue. Strong light sources are evident in all directions. The Milky Way is totally invisible or nearly so. M44 or M31 may be glimpsed with the unaided eye but are very indistinct. Even in moderate-sized telescopes, the brightest Messier objects are pale ghosts of their true selves. The sky glows whitish gray or orange. M31 and M44 may be barely glimpsed by an experienced observer on good nights. Only the bright Messier objects are detectable with a modest-sized telescope. 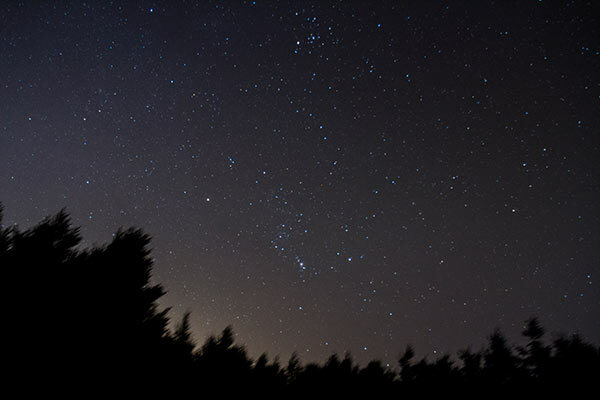 Some of the stars making up the familiar constellation patterns are difficult to see. The entire sky is brightly lit, even at the zenith. Stars making up familiar constellation figures are invisible. Dim constellations such as Cancer and Pisces are not seen at all. Aside from Pleiades, no Messier objects are visible to the unaided eye. 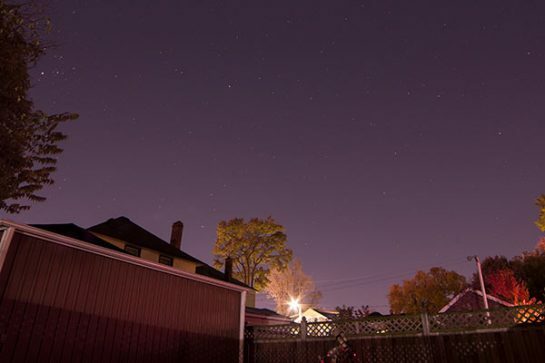 In terms of backyard astrophotography, your sky quality can have a huge impact on your images. Deep sky imaging under a bright city sky means that you’ll have to put a lot more exposure time into your projects than someone in a rural location. You’ll need to work harder to improve the signal-to-noise ratio of your final image because the signal (light emitted from the object) is buried underneath a layer of light pollution. 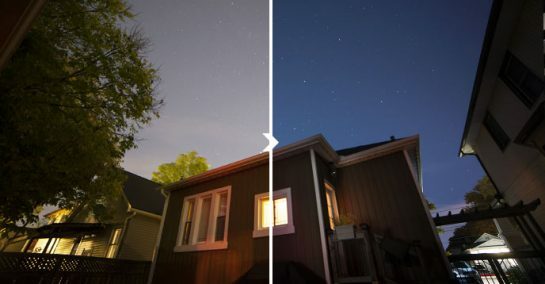 To help capture images with improved contrast and less background sky glow, I use light pollution filters that isolate specific wavelengths of light. A typical CLS filter (City Light Suppression) will ignore many of the common sources of artificial light from the city including streetlamps. The only downside to using a filter like this is the change in natural star color you may notice, which will need to be addressed in post-processing. In general, broadband filters such as the Optolong L-Pro aim to capture true-color images in RGB with less light pollution. However, if you really want to cancel out almost everything but the light your deep sky object is emitting, consider using a narrowband filter. For example, a 12nm Ha filter like the Astronomik EOS clip-in will record light from emission nebulae using a very narrow bandpass. Narrowband filters are a tremendous option for amateur astrophotographers shooting in challenging Class 6-9 skies. If you are interested in learning more about astrophotography, have a look at my top 7 tips for beginners. Don’t let light pollution spoil your enjoyment of astronomy. There are unlimited ways to enjoy the night sky, even if you’re under heavily light polluted class 8 skies. I’m proof!